Although it may not be obvious at first glance, July 2009 is looking like a strong month. Aside from the two big bruisers (Potter and the token CGI release), there are enough movies that have the potential to end up around, or even solidly over, the $100 million mark. There is also a higher than average concentration of family films competing for the same demographic - a sure sign of some bad scheduling decisions. 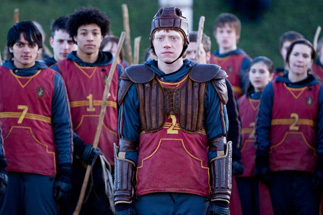 The Harry Potter films are becoming like this decade's version of the Friday the 13th series. They just won't stop making them (no letters, please; yes, I know there's some semblance of difference between the two). No matter how many times it looks like Potter is finally dead, they always bring him back for another go-around. Where did the last one - part 5, was it – leave off? Was that the one where they accidentally resurrected Potter with a lightning bolt, and then had to spend the movie trying to drown him again in Hogwarts Lake? Or was that the one where he had to fight that pissed-off psychic teenage girl? Well, if Potter can survive that, I doubt he's going to have any trouble making it through whatever they have lined up for him this time. As long as the series fundamentals are the same - a bunch of horny teenagers, a lake, and the somehow-still alive Potter on the rampage again - this latest and decidedly needless entry will have no trouble raking in the cash. And if it's a success, I imagine we're going to get another sequel. Or two.